As an accent wall, especially in a room with a neutral paint color like this. I could see this in a home office or a dining room. A sweet soft color for a baby could carry them into older years in a classy way. Sticking with a pale gray is a nice way to be able to incorporate any color in the room in the future. 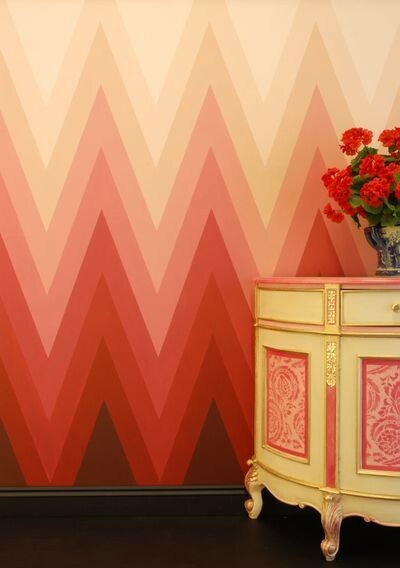 This is a different spin on chevron, graduate the colors for a bold look. I love yellow so this wall is probably my favorite. If you have a small partition wall, don't ignore it. Make it stand out like this one. If you aren't completely sold on chevron or want a temporary fix of it, paint a tryptic of canvases (always do odd numbers instead of even) in a bold color or metallic, like these, which I really love. Where would you put chevrons?